With his thoughtful restructuring of America’s military, secretary of defense Chuck Hagel — a Republican — has cemented Obama’s signature legacy: restoring America to a peacetime footing. Obama’s bringing American troops home from two wars, and, now, reducing the military to a strong, but proportionate, peacetime footing, was not easy. Doing so required something of a political miracle. 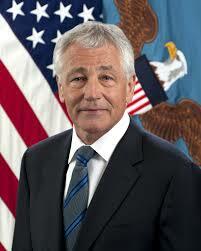 Obama, with a critical assist from Hagel, is pulling it off. President Reagan’s stated reason for invading Grenada (and deposing the government there, something Putin studiedly has not shown signs of attempting in Ukraine) was to protect 800 American medical students. Putin is not neo-imperialist. This predicament is likely to end with a Russian-led bailout of an insolvent Ukraine. The severe difficulties in Ukraine shall pass without reigniting the Cold War. Thus has the Republican Secretary Chuck Hagel cemented the Democratic President Obama’s legacy. Both thereby make a great contribution to America’s well being and, likely, to history. Guiding America home to, or at least toward, a peacetime footing — not Obamacare — is Obama’s signature achievement. It is one that deserves recognition from conservatives and libertarians as well as progressives … and from all Americans.